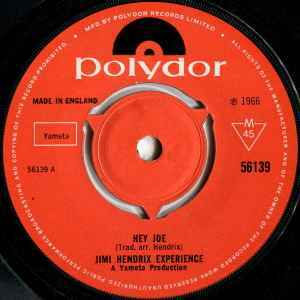 First released anywhere in the world in the U.K. on Polydor 56139 on December 16th, 1966, coupling "Hey Joe" and "Stone Free" and crediting "The Jimi Hendrix Experience"; some editions credit Jimi Hendrix. "Stone Free" recorded at De Lane Lea Studios, London, Wed. 2nd Nov. 1966. Entered U.K. Charts on Thu. 29 Dec 1966, achieving # 6 position on the 4th of Jan. and spending 11 consecutive weeks on chart. No Canadian issue? No Canadian issue? No Canadian issue? Plain white backside? Runouts? Anything to segregate this one from the other 3 Norwegian issues thanh you. Weird because the RSD list said 3000.